Food safety is a cultural construction, culturally and temporally specific. 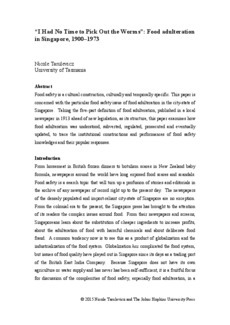 This paper is concerned with the particular food safety issue of food adulteration in the city-state of Singapore. Taking the five-part definition of food adulteration, published in a local newspaper in 1913 ahead of new legislation, as its structure, this paper examines how food adulteration was understood, subverted, regulated, prosecuted and eventually updated, to trace the institutional constructions and performances of food safety knowledges and their popular responses.